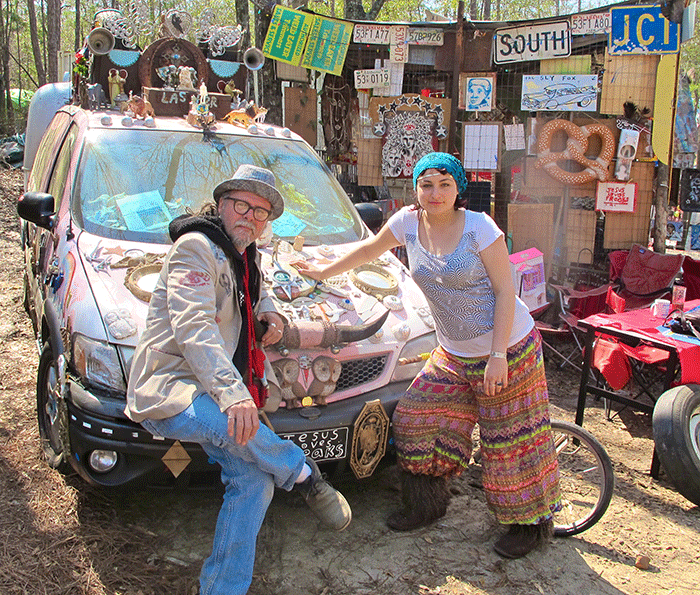 “I dare you to go to the Doo-Nanny,” wrote my hillbilly POP/visionary folk art friends from Kentucky. For those who don’t know what it is, it’s a folk art festival in rural Alabama featuring the freakiest, funkiest and folkiest artists from the South. The Doo-Nanny was only a few weeks away and I searched for a one-way flight to Alabama. I couldn’t find anyone to pick me up from the airport so I asked my friends from Kentucky. “We can get you in Nashville,” they said. “But you will have to carry the birds on your lap. Can you get there by Sunday at 9am?” It was Friday. “Yes!” I said and with that, I booked my flight to Nashville. The InnerGalacticShack-O-llacc circus art car van was awaiting me at the airport. Their art car was covered in plastic toys, giant letters that spelled LOVE and ART and a front license plate that said “Jesus Loves Freaks.” People were crowding around the art car snapping photos and I scanned the crowd for my friends. “There’s Yooosefa!” cried Ruby Elvis Rose, my eight-year-old friend. We piled into the car with Ruby’s parents, C.M Laster and Grace Kelly, and began our 20-hour ride to Alabama. The ride was going smoothly and we passed through the states with ease… until we hit Alabama. Both trailer tires popped and the car swayed back and forth as it scraped the road to a slow and treacherous halt. Ruby, the birds and I stayed put in the back of the car while her folks tried to fix the tires. Two men in a white truck pulled off the side of the highway and wandered over to help. Ruby looked at me with wide eyes. “He is wearing a Romney shirt!” she said shaking her finger. I’m not sure if I was more surprised by an adamant eight-year-old Democrat or an adamant eight-year-old Democrat from Kentucky. Things were looking ok again until the rainstorm started and within minutes we were once again on the side of the highway. The cops eventually showed up after a car full of Pentecostals proved to be unhelpful. The next 20 minutes were both the best and most terrifying moment of my life. C.M Laster and I got a ride to Walmart with an officer who was driving 120 mph, blasting heavy metal music (‘Let the bodies hit the floor, let the bodies this the flooooooor!’) and texting. Yosefa Leora Kornwitz is a journalist based in Rhode Island. If you want to present her with a dare, she can be contacted at yomotif@gmail.com or at DareMe Yosefa on Facebook. She can also be followed at @goagnome on Instagram. Next post: As the Stories Continue to Unfold This month: Major developments on a handful of our Hummel Report investigations.